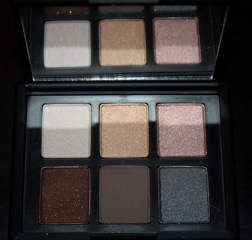 I love it when Nars releases new palette’s and when I can get my hands on them. About the same time as the fall 2012 was released, two new palette’s with repromotes of existing colours were also made available. The American Dream palette contains a selection of neutrals, while the New Wave palette is a more bold offering electric colours for edgier looks. On one hand with repromotes you run the risk of having a lot of the colours in your own collection, but luckily I only had one colour in the American Wave palette and quite a few of the shades are one’s I wanted for some time. The top 3 shades are your good for highlighting, use as a base colour or layered over Bali. All are pretty and with soft iridescence. The bottom row add depth to this collection .These 3 are highly pigmented and a dream to apply. The first shade Bellisima (1), is a whitish/cream sparkle, which I would reserve for highlighting the centre of the lid or if you are fair, under the brow. The next shade Alhambra (11) is a soft gold. The last of the top shades is Silk Road (11) which is a peach with gold undertone. The first of the darker colour is Galapagos – a cult favourite amongst Nars fans. It is a medium rich brown with visible gold reflects. It really is beautiful for shading the outer corner or over the entire lid. The middle shade is Bali. This is a matte flat brown – depending on your skin tone you can use it as a contour shade for the bow bone area, or as a liner. The last shade is Tzarine (11). This is the one I own already in the duo format. It is a modern steel grey with tiny sparkles. I love this colour and it works well on all eye colours. I consider this a neutral palette with a twist. It is perfect for soft everyday looks as well as modern smokey eyes in a few ways. This would be great for travel too. There is a mix of texture and all the shades work harmoniously together to create countless looks. So while I love it when Mr Nars work his wizardry and conjures up new exciting limited colours. I am loving this limited palette, which takes existing colours and puts them together in ways that even if I had them all as separates, would probably never put them together myself. The New Wave palette also looks like a good buy, but I do own 3 out if the six shades already. What do you think of the new Nars palettes? Next Next post: My Favourite cleansers-Highly recommended !